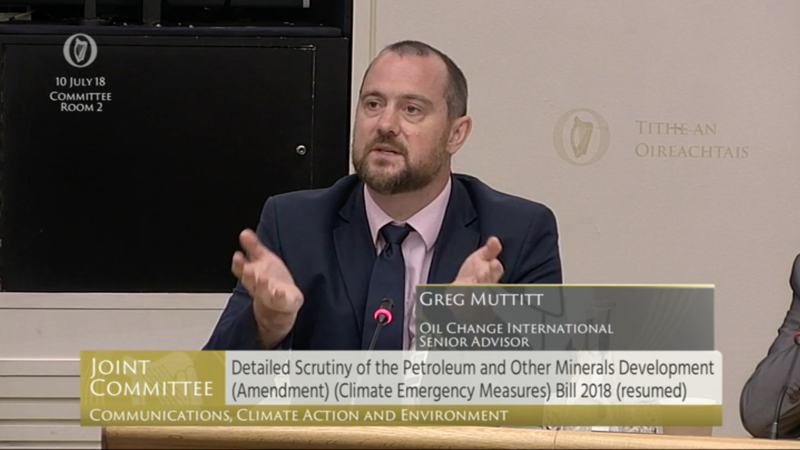 Last week I had the honour of presenting evidence to the Irish parliamentary committee that is scrutinising the country’s proposed Climate Emergency Measures Bill, to end all new oil and gas exploration licenses. (See edited video below (5 min) or full here (12 min), statement or slides). The Bill, proposed by Deputy Bríd Smith, would see Ireland join a growing group of countries that recognise new fossil fuel development is not consistent with efforts to address climate change, including Costa Rica, France and New Zealand (for its offshore). While the Bill is opposed by Ireland’s minority government, it has so far received support from opposition parties making up a majority in the parliament. Later in the week, parliament approved a separate Bill to make Ireland the first country to divest its financial assets from all fossil fuels. Both Bills reflect a fast-moving debate on climate action, driven by smart campaigning by groups such as Trócaire and the Stop Climate Chaos coalition. This is a country that also banned fracking last year. I shared two pieces of Oil Change International’s research with the committee. The first, published in our 2016 report, The Sky’s Limit, finds that emissions from the oil, gas and coal to be extracted from already-developed fields and mines would take the world beyond 2 degrees Celsius of warming. The oil and gas alone would take it beyond 1.5 degrees. When in a hole, you should stop digging, as the saying goes, and so stopping opening new fields and mines as the Irish Bill proposes, is a vital step towards achieving the Paris goals. The second piece of research, featured in a special OCI report published in Ireland last week, counters a prevailing narrative from fossil fuel companies and some governments that fossil gas can be a “transition fuel” on the way to renewable energy. That research finds that there is no room for new gas in IPCC 2-degree emission scenarios: gas use must decrease not increase (even to replace coal). Furthermore, new gas competes with wind and solar energy, and so slows down the growth of those clean energy technologies. The conclusion from those two studies is that the Paris goals require a managed decline of production from existing fields and mines, while devoting all future investment to clean energy and ensuring a just transition for affected workers and communities. As I argued to the parliamentarians in Dublin, this Bill is necessary to achieve the Paris goals. It is correctly targeted at oil and gas production. The corresponding energy transformation is achievable. And the Bill will help Ireland both achieve its climate commitments at home and influence others to do so on the global stage. I was followed by Paul Allen of the Centre for Alternative Technology, coordinator of the Zero Carbon Britain initiative. He demonstrated that powering the UK with zero-carbon energy by 2050 (and by extension Ireland, whose energy markets are similar and connected) is both feasible and affordable. My abiding memory of the experience in Ireland’s parliament was the quality of the questions asked by the committee members. In contrast to countries where political discourse is stuck either on debating whether climate change is real, or on insisting that fossil fuel extraction is unrelated to climate change, here were politicians genuinely engaged in how their country could best contribute to addressing the global problem of climate change. The deputies asked me about how Ireland’s costly oil potential might fare during the transition, how fast production would decline and how clean energy can step up at that pace, and the potential of energy storage technology to address wind variability. These are precisely the sorts of questions our leaders should be grappling with: how (not whether) to manage a transition. (Full video of the discussion here, 10 July, starts at 29 min). And since the debate is rational and evidence-based, in contrast to certain less-civilised countries, there is an important supporting role for international research, whether on climate limits to fossil fuels, or on the potential of clean energy. The Irish experience, on divestment, fracking, and soon ending exploration, shows how much can be achieved by committed civil society and serious parliamentarians, on an issue we are often told is impossible to fix. It was humbling to contribute in a small way to a country’s leadership in tackling the contribution of fossil fuels to climate change.